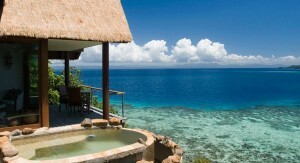 We longed to go to Fiji and most importantly Royal Davui Resort & Spa. After departing from Nadi airport we drove along the Queen’s Highway, stopping to take advantage of the amazing views and the occasional cow that was crossing the road. They now include round trip flights which cuts transfer time, but this was a fun way to see the countryside! We passed the town of Sigatoka and may Fijian Villages, schools and churches before arriving at the coastal town of Pacific Harbor where we met by a Royal Davui staff member. The boat transfer to the island was fast and swift. At first we saw only a greenish blue dot on the horizon, but as we drew closer the island came alive with palm trees swaying, the Vales perched on the sides of the island and the old wooden dock that led the way to our island paradise. We were greeting with a chorus of warm Bula’s as we entered the main Bure (check in area). A few steps away was the bar followed by the restaurant, which almost has a tree house feeling. Beyond the restaurant was a path leading down to the fresh-water swimming pool, and the beach. They say at low tide you can walk around the entire island! After the brief tour we were led along the path towards our Vale. When the door opened, my jaw dropped; I was speechless. The view from the accordion style window and doors was breathtaking. The entire wall opens and really gives you the feeling like you have an extension to the living area. Another surprise was the aroma of freshly baked banana bread waiting for us at the mini bar. They say that it is a family recipe, what a nice homey touch! The bedroom/bathroom is just a quick couple of steps away from the living area with yet another set of glass doors, opening up to a second deck with sun loungers. The king size bed was clothed in a white canopy and white linens. Up another 2 steps and we found the bathroom, with cool travertine tiles lining the floors and walls, double vanity sinks, a toilet room, a large walk-in shower and a Jacuzzi tub. The biggest surprise in the bath area was the ceiling above the tub, with a louvered panel that allowed ribbons of sunshine in during the day and the starlight at night, amazing! The first night was spent with a candlelit dinner for two on the deck of our Vale followed by a soak in the outdoor soaking tub. 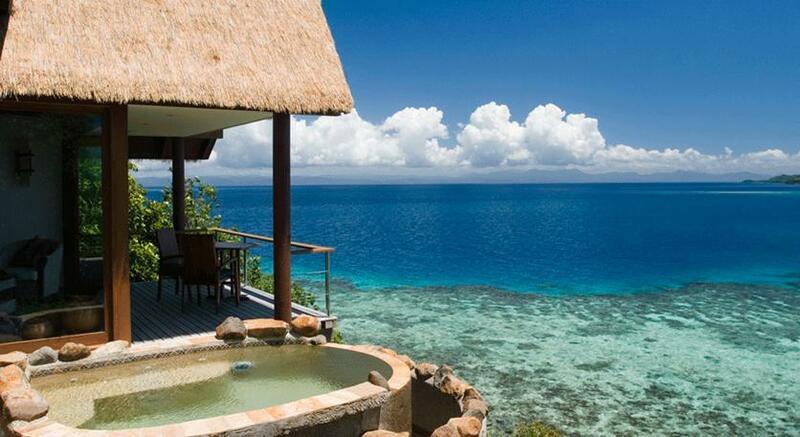 When in the tub you feel as though you are suspended off the island! The snorkeling off the island showed the vibrant coral and colorful tropical fish found around the island. We heard other guests talking about the shark dive and the sea turtles during an excursion near the island of Beqa. We didn’t dive and I am glad that the sharks stayed out in deeper water! One morning we were whisked off for a bit of private time at the sand quay only accessible at low tide. We were dropped off with a picnic basket of goodies, snorkeling gear and towels. This was a highlight of our trip, just the two of us alone with nothing but 100 shades of blue surrounding us. Can you imagine a better way to start off your honeymoon? We cannot say enough of the island staff. Never was there a need that wasn’t met. They made our stay magical. Our last image of Royal Davui was the staff serenading us Isa Lei, the Fijian farewell song – we had tears in our eyes and vowed to return one day. Again, we return along the Queen’s Hwy and Fiji’s Coral Coast although this time we are deep in thought, reflecting on our time at Royal Davui and the happiness we felt during our stay. We felt as though we were truly on our own private island much of the time during our stay. Our departure from Fiji was bitter-sweet. While we long to get back to family and friends we felt as though we also left a small piece of our hearts in Fiji on Royal Davui Island.